Niccolò Jommelli (September 10, 1714 – August 25, 1774) was an Italian composer. 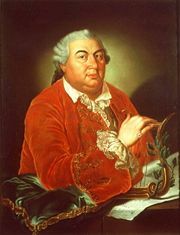 As a student of the Neapolitan School and a follower of Gluck's operatic reforms, Jommelli proved to be a unifier of cultures and ethnicities by combining German, Italian, and French musical elements in his operatic style to form bridges of reconciliation and cooperation through musical means. Jommelli was born to Francesco Antonio Jommelli and Margarita Cristiano in Aversa, a town some 20 kilometers north of Naples. He had one brother, Ignazio, who became a Dominican monk and helped the composer in his old age, and three sisters. His father, a prosperous linen merchant, entrusted Jommelli to the choir director of the cathedral, Canon Muzzillo. As he had shown talent for music, Jommelli was enrolled in 1725 at the Conservatorio di Santo Onofrio a Capuana in Naples, where he studied under Ignazio Prota and Francesco Feo. Three years later he was transferred to the Conservatorio di Santa Maria della Pietà dei Turchini, where he was trained under Niccolò Fago, having Don Giacomo Sarcuni and Andrea Basso, as second maestri, that is, singing teachers (maestri di canto). His first opera, the comedy L’errore amoroso, was presented, with great success, under the patronage of the Marquis del Vasto, Giovanni Battista d’Avalos, the winter of 1737 in the Teatro Nuovo of Naples. It was followed in the next year by a second comic opera, Odoardo, in the Teatro dei Fiorentini. His first serious opera, Ricimero rè de’ Goti, presented in the Roman Teatro Argentina in January 1740, brought him to the attention and then the patronage of the Duke of York, Henry Benedict. The duke would later be raised to the rank of cardinal and procure Jommelli an appointment at the Vatican. During the 1740s Jommelli wrote operas for many Italian cities: Bologna, Venice, Turin, Padua, Ferrara, Lucca, Parma, along with Naples and Rome. When in Bologna in 1741, for the production of his "Ezio," Jommelli (in a situation blurred with anecdotes) met Padre Martini. Saverio Mattei said that Jommelli studied with Martini, and acknowledged to have learned with him "the art of escaping any anguish or aridity." Nevertheless, Jommelli’s constant traveling in order to produce his many operas seems to have prevented him from ever having any lessons on a regular basis. Moreover, Jommelli’s relationship with Martini was not without mutual criticism. The main result of his stay in Bologna and his acquaintance with Martini was to present to the Accademia Filarmonica of that city for the procedures of admission, his first known church music, a five-voice fugue a cappella, on the final words of the small doxology, the Sicut Erat. The musicologist Gustav Fellerer, who examined several such works, testifies that Jommelli’s piece, though being just "a rigid school work," could well rank among the best admission pieces now stored in the Bolognese Accademia Filarmonica. During the early 1740s Jommelli wrote an increasing amount of religious music, mainly oratorios, and his first liturgical piece still extant, a very simple "Lætatus sum" in F major dated 1743, is held in the Santini collection in Münster. The appointment of Jommelli, recommended by Hasse, as maestro di cappella to the Ospedale degl’ Incurabili in Venice is not definitively documented. However, in 1745 he did start writing religious works for women’s choir to be performed in the church of the Incurabili, San Salvatore, a duty that was—together with the tuition of the more advanced students of the institution—part of the chapel master’s obligations. There are no autographs of Jommelli’s music composed for the Incurabili, but there are many copies of different versions of several of his works that may, with some certainty, be attributed to his period as maestro there. Among the music Helmut Hochstein lists as being composed for Venice are to be found four oratorios: "Isacco figura del Redentore," "La Betulia liberata," "Joas," "Juda proditor"; some numbers in a collection of solo motets called Modulamina Sacra; one Missa breve in F major with its Credo in D major; probably a second mass in G major; one Te Deum; and five psalms. Though some his earliest biographers, Mattei and Villarosa, give 1748 as the year when Jommelli gave up his employment in Venice, his last compositions for the Incurabili are from 1746. He must have left Venice at the very end of 1746 or at the beginning of the following year, because on January 28, 1747 Jommelli was staging at the Argentina theatre in Rome his first version of the "Didone abbandonata," and in May at San Carlo theatre in Naples a second version of "Eumene." It was the need of an active chapel master for the basilica of Saint Peter’s in preparation for the Jubilee festival year that brought both Jommelli and David Perez to Rome in 1749. The Jubilee is a year-long commemoration which the Roman Catholic Church holds every fifty years. Therefore this was an important occasion for Roman aristocratic society to show off. Jommelli was summoned by the Cardinal Duke of York, Henry Benedict, for whom he wrote a Metastasian oratorio, "La Passione"—which continued to be played yearly in Rome—and who presented him to Cardinal Alessandro Albani, an intimate of Pope Benedict XIV. He subsequently visited Vienna before taking a post as Kapellmeister to Duke Karl-Eugen of Württemburg in Stuttgart in 1753. This period saw some of his greatest successes and the composition of what are regarded as some of his best works. Many were staged at the Duke's private theatres in the Palace of Ludwigsburg, outside Stuttgart. Mozart and his father passed through Ludwigsburg in 1763 and met the composer. Jommelli returned to Naples in 1768, by which time opera buffa was more popular than Jommelli's opera seria, and his last works were not so well received. He suffered a stroke in 1771 which partially paralyzed him, but continued to work until his death three years later. He died in Naples. Jommelli wrote cantatas, oratorios, and other sacred works, but by far the most important part of his output were his operas, particularly his opere serie of which he composed around sixty examples, several with libretti by Metastasio. In his works, he tended to concentrate more on the story and drama of the opera than on flashy technical displays by the singers, as was the norm in Italian opera at that time. He wrote more ensemble numbers and choruses, and, influenced by French opera composers such as Jean-Philippe Rameau, he introduced ballets into his work. He used the orchestra (particularly the wind instruments) in a much more prominent way to illustrate the goings-on of the story, and wrote passages for the orchestra alone rather than having it purely as support for the singers. From Johann Adolph Hasse he learned to write recitatives accompanied by the orchestra, rather than just by a harpsichord. His reforms are sometimes regarded as equal in importance to Christoph Willibald Gluck's. Jommelli, Niccolo and Metastasio, Pietro. 1978. Demofoonte. New York: Garland Pub. This page was last modified on 21 November 2018, at 21:55.